Savvy Spending: Bought Milk Class Action Lawsuit- you may be eligible to receive a $30 refund! 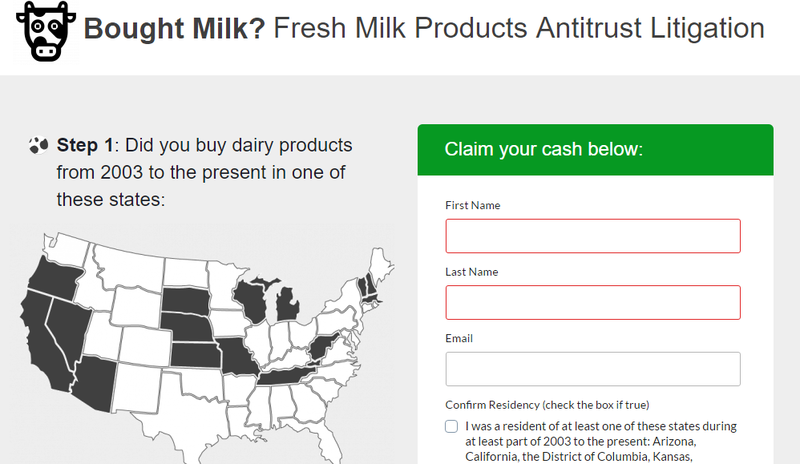 Bought Milk Class Action Lawsuit- you may be eligible to receive a $30 refund! 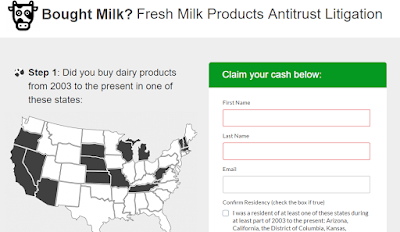 You may be eligible for a $30 refund in the "Bought Milk" Class Action suit! If you have purchased milk products (milk, cream, half and half, yogurt, cottage cheese, cream cheese or sour cream for your own use – not for resale) from 2003 until now and live in one of the following states – Arizona, California, the District of Columbia, Kansas, Massachusetts, Michigan, Missouri, Nebraska, Nevada, New Hampshire, Oregon, South Dakota, Tennessee, Vermont, West Virginia or Wisconsin, you may qualify for up to $30 or more in the “Bought Milk” class action lawsuit. To submit your claim, go here and complete the form no later than January 31st, 2017. This suit has been brought against major U.S. dairy producers (including Land O’ Lakes, the National Milk Producers Federation, Dairy Farmers of America and Agri-Mark) following accusations of slaughtering more than 500,000 cows to reduce milk supply, therefore artificially inflating prices. It's a shame farmers felt is necessary to do this to make a living and not lose their farms and homes. The government used to pay farmers to plow their crops under to raise food prices, but that was OK...It was the Government...I don't think they do that any more, but who knows?...they did that when we still had to pay taxes on food! No surprise; the Government will always self-serve.